seeIT Promotional operates on a PC Platform, But, we are happy to receive artwork generated on either PC or MAC as long as they conform to the requirements set out on this page. We do not use QuarkXpress or CorelDraw. Please do not supply art files in this format, instead collect and save the file as an EPS. We also cannot accept artwork files generated in any Microsoft products such as Word, Publisher, or Frontpage. Scanned images cannot be manipulated. Text, logos, borders, etc. should be created in a drawing / layout program such as Illustrator, FreeHand or InDesign. This allows us to make necessary adjustments to the digital file. It is recommended that all artwork be submitted at actual size with correct proportions. If your file is too large at actual size, you may submit it at 1/2 size (50%). Please take into account that the file DPI must be set accordingly. For example a 36in x 24in file sent as 18in x 12in must have a resolution of at least 300 DPI so that when enlarged to actual size there will be a minimum of 150 DPI. For the fastest service, please make sure any Print Ready files are set up at the correct proportions. Vector files can be submitted at a smaller scale as long as the proportions match. For example, artwork for a 2’x4’ sign should have a height to width ratio of 1:2. Four-color digital printing is used for reproducing high quality graphics and images. Digitally created images should be created in or converted to CMYK (cyan, magenta, yellow, black) format. Some programs, such as Photoshop, default to RGB (red, green, blue) format and must be changed. *Note any color change in the image when converting from RGB to CMYK and adjust colors as needed. Please make sure all submitted files are in CMYK colors. 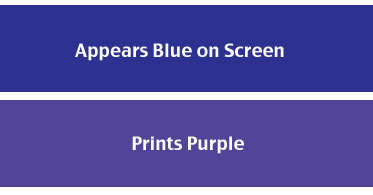 RGB colors (as seen on computer screens) cannot always be replicated on a CMYK print, especially bright neon colors. Web proofs are required to be in RGB color, so some color shift between the proof and the final print is to be expected. Any color depicted on your screen is meant to represent the final print color only in the most general sense. Rich black is an ink mixture of solid black, 100% K, with additional CMY ink values. This results in a darker tone than black ink alone. If you print black alone as 100% K, the resulting black may not be as dark as you desire. 100% K on screen looks black but will print lighter, use C=60%, M=40%, Y=40% and K=100% for a deep rich black. We work with standard color profiles but cannot guarantee Pantone or any other kind of color matching. If you have a large order on which color matching is important, you may supply us with a swatch number from a Pantone Color Bridge book, which illustrates how Pantone colors will appear if printed in CMYK. We can only attempt to match the colors on the CMYK side of the Color Bridge book. We will work with you to get the closest color possible and will ship samples for approval if needed for an additional fee. Please click here to download the Pantone Color Bridge PDF. When it comes to creating graphics, designers must choose to express their creativity using either vector or raster graphics. Each of the graphic types have their own particular strengths and limitations and understanding these differences is essential to achieving the best results. Vector images are constructed of lines (also called paths) and are created by software programs that use mathematical calculation to determine size, shape and color of each line. By combining paths that are straight or curved and various colors and shading very detailed illustrations can be created. 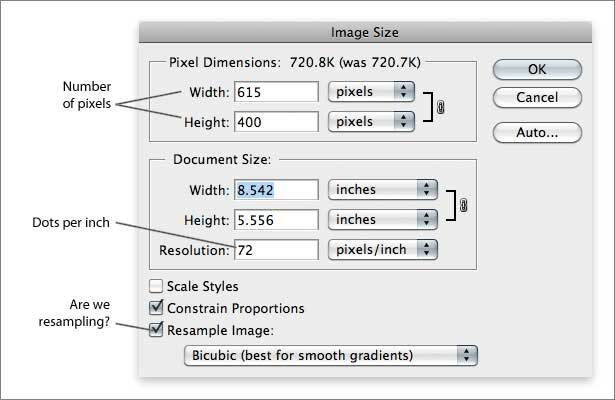 Because the image is created using mathematical precision using programs like Adobe Illustrator or CorelDraw, the resulting files can easily be resized larger or smaller without any loss in image quality. In the example to the right we have enlarged an image and compare the vector results against raster. As you can see, the enlarged vector version retains the crisp edges of the original. Vector graphic files sizes are usually much smaller than raster files making them easier to store and share. 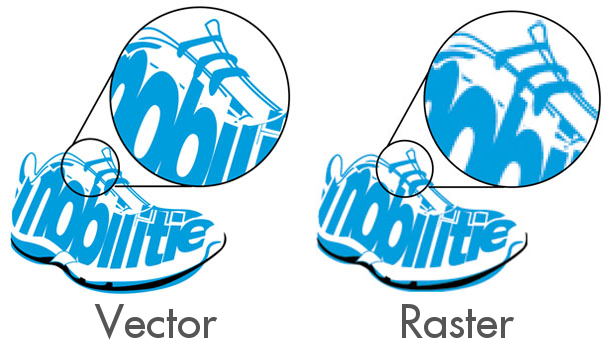 It is easy to convert a vector graphic to raster if needed. Vector Graphics are resolution independent. You can make them larger or smaller without a loss of image quality. Vector files simply do not handle photographic imagery as well as raster files. When you are designing something for large scale like banners, signage, vehicle wraps and other large format items. Vector graphics are the best choice for business identity print work, logos, promotional posters, and major illustrations. *Please read the section titled "Accepted File Formats" for a list of vector formats we accept. The most common raster image is a photograph, though with a graphics program like Adobe Photoshop artists can create raster images other than photographs. A raster image is created by a series of pixels or dots. 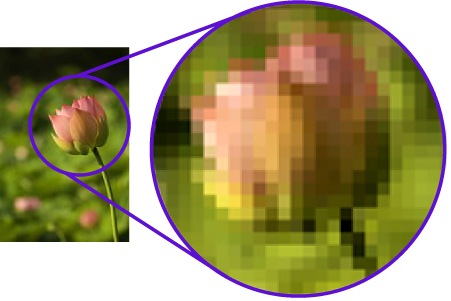 Each pixel is assigned a color value and packing many dots into a small area creates the illusion of a crisp image. Printers often talk about raster image resolution, which is determined by how many dots there are per inch (dpi). 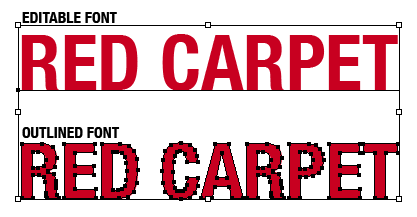 Because raster images are created by a series of dots, they do not scale up well as seen in the graphic above. At its original size the image looks fine, but when enlarged the quality and sharpness of the image suffer. It is for this reason that most printers set a minimum standard resolution of 150 DPI (for larger prints) and 300 DPI (for smaller prints) when printing raster graphics. Anything less will simply not look very good. Raster files handle the subtleties of photographs very well as a general rule. Raster can handle other effects such as adding textures or blur effects very well. 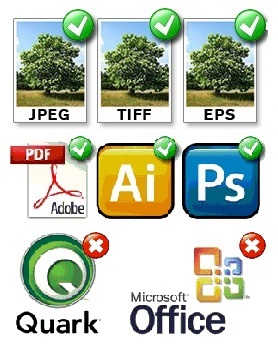 Raster files are highly dependent on image resolution to reproduce accurately in print. As a general rule it is a bad idea to enlarge raster images due to pixellation. Raster conversion to vector is difficult. We often here the question "Which graphic format is better?” In truth, both vector and raster graphics can be used to produce excellent results when you understand their strengths and limitations. We always without exception ask that any files which contain text/fonts have the fonts converted to "outlines" (aka converted to "curves" or "shapes" depending on which software you use) in order to eliminate font issues. If this is not possible then we will require compatible fonts to be supplied with the art file. Compatible fonts must be either True Type, Open Type, or Type 1, but ideally we would prefer not to have to deal with font files at all. We recommend avoiding small fonts because they’re difficult to print and may appear pixelated when printed on the product. Fonts/Text less than 11 points are not guaranteed. If images are linked to your file, please provide source file (linked image) along with your artwork. Additionally you may embed your image into your final file prior to sending. If a file is missing a linked image production of your order may be delayed. For products that will include hem and grommets, such as X-Banners, we recommend all text and important graphics are at least 1” away from the edges of your art. This will ensure no grommets are punched through your important images or messages. Specific bleed information is included for each product in the Product Info tab. CAN MY ART BLEED OFF THE EDGE? Yes. Though it is not recommend on products such as Yard Sign, Rally Sign & Sidewalk Signs, your artwork may contain full bleed. On all other products we print with full bleed unless otherwise noted. ARE ARTWORK/DIE TEMPLATES AVAILABLE FOR PRODUCTS OFFERED? Yes. Under the resources tab of each product there is a link for downloading artwork/die templates. DOES seeIT Promo OFFER ARTWORK SERVICES? seeIT Promo does have design capabilities. However our services are limited to touch-up/setup only and is not offered as a standalone service. Please read the General Info page for artwork rates. I AM HAVING TROUBLE PUTTING TOGETHER PRODUCTS RECEIVED, ARE INSTRUCTION SHEETS AVAILABLE? Although most of our products are simple and straightforward to assemble, sometimes you may have difficulties. We have instruction sheets for some products, but not for all. Instruction sheets can be found under the resources tab of the product page. Please also feel free to browse the "Help Videos" to the left of this page for additional product help. IN WHAT FORMAT SHOULD I SETUP ART FOR SUBMITTING ORDERS? Please browse to the top of this page for detailed artwork requirement. Please note that it is the responsibility of the distributor to follow the guidelines and submit art in the correct format. SeeIt Promo sells through promotional items distributors. If you are interested in our products contact your local promotional products distributor. They are listed in the yellow pages under advertising specialties or promotional products. Mention "seeIT Promotional asi/62620", they will know how to find us. If you are a distributor and want to learn more, please email us at sales@seeitpromo.com or click here. WHAT OPTIONS ARE AVAILABLE FOR ARTWORK SUBMISSION? Artwork can be sent via Email, Online Artwork Submission Form or CD sent by mail. For email submission please send artwork along with PO to sales@seeitpromo.com. To submit via online form please visit the "Submit Art" page by clicking here. To mail your art on a CD, please contact us for mailing address. Please note that CD's will not be sent back after order is complete. Please make sure to have a duplicate handy in the event of you needing it in the future. MY QUESTION IS NOT LISTED, CAN I CONTACT seeIT PROMO FOR ADDITIONAL HELP? Sure. Please feel free to contact us with any questions you might have. Unfortunately since we sell through a distributor network only, Please have your Promotional Items Specialist be in contact with us. Our ASI Identification number is 62620. Please provide our ASI ID Number to your distributor so that they can easily contact us. If you are a distributor please contact us via email sales@seeitpromo.com or our "Distributors Contact Form" found here.